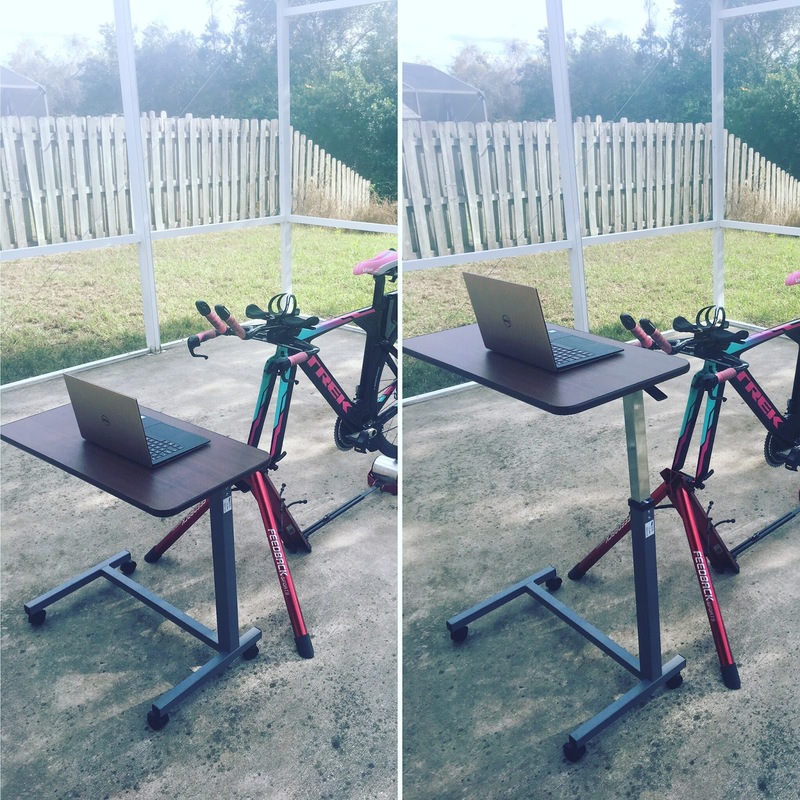 Looking for a Wahoo Kickr Desk alternative? 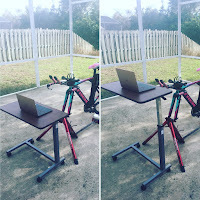 Simply put, the best cheap indoor bike trainer desk is a medical overbed. My favorite one is the $60 Vaunn Medical Adjustable Overbed and is the one I use. Some people prefer a stand that has a slot for iPads and this Conquer desk for $149 is similar to the Wahoo Kickr desk in design. Please note that Conquer desk is currently sold out until mid to late January 2019. The Vaunn medical desk has recently risen in price due to trump tariffs but Vaunn has a 10% coupon code to bring it back down a bit. Use 10TABLEB to save $10 at Amazon. For those unfamiliar, medical overbeds are designed to have a telescoping table platform, slide underneath the bed of a patient, and are for tasks like eating & tv watching. However, they make excellent indoor cycling desks, media carts, and laptop stands. Adjusts from 28 inches to 40 inches. Has wheels and can be moved easily both for storage or in case you need to adjust the position while cycling. The height of the table can be adjusted easily with one hand. Bike Maintenance - I will set a towel on top and place all the tools I will need for the job. The telescoping up/down platform is easy to do one-handed and the table moves smoothly. 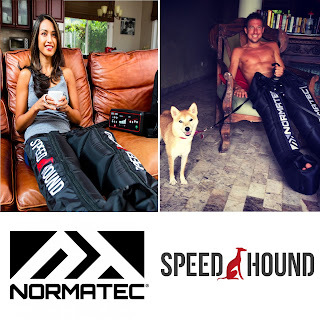 Laying in the bed with the boots - using recovery compression boots and a laptop, although doable, sometimes I prefer to use the overbed as a more stable platform that isn't going up and down with the expansion and contraction of the boots. As a true TV Tray - I will admit, I have never actually used this as a TV tray, but I would presume many people could. Thomas Gerlach. I don't suppose you're from Cologne? I am not, sorry. I am from Wisconsin. Thanks I bought this and using it like you, I put it on the side of my bike and put my laptop there and phone as well. I will drill a big hole in the desk and pull a 6 port USB charger cable through it and place the USB charger on the desk too, I will also run the laptop power cable through the hole too. This way I can neatly run the cables to the top of the desk and charge the laptop and several phones at once. Great post and I got this because of you and like it very much. Thanks for sharing. Great idea. I currently use a regular tv tray but this will be a big improvement. I think I will combine this with my tout sur les abdominaux for sure.